Airdate: Dear Mom, Love Cher. Bio will screen a documentary, executive produced by Cher, which looks at the life of her mother Georgia Holt, beginning with Holt’s early years in rural Arkansas, leading to her six marriages and dreams of becoming a singer and an actor. Dear Mom, Love Cher screens in the US in early May and airs on Mother’s Day in Australia. Cher has been on a rollercoaster ride of love, success, and heartache – not unlike the life of her 86-year-old mother, Georgia Holt (born Jackie Jean Crouch). Dear Mom, Love Cher is a one hour special focusing on Holt’s family history starting with her childhood in rural Arkansas, following her through her six marriages, her pursuit of a career in entertainment, and culminating in her realisation of a childhood dream singing on her own music album. 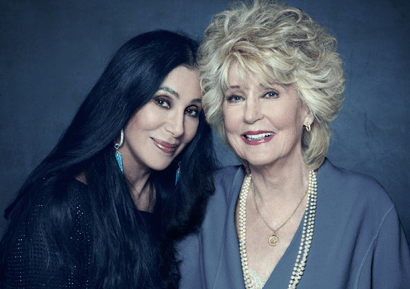 Just in time for Mother’s Day, the documentary features interviews with Holt, daughters Cher and Georganne LaPiere Bartylak, and grandchildren Chaz Bono and Elijah Blue Allman. Born in 1926, Holt has seen and been through it all, including poverty and temporary forced separation from her children. She sought fame and fortune in Hollywood and found some success as an actress, appearing in I Love Lucy and Ozzie and Harriet, and eventually helped Cher pursue a career in showbusiness. Cher and her mother bear a striking resemblance to each other and they also share a very similar singing voice. The documentary debuts their never-before-heard mother and daughter duet performance, along with the long-lost recordings Holt taped more than 30 years ago which Cher has re-mastered for commercial release concurrently with the special. Foxtel’s Bio channel has acquired Australian television rights of Dear Mom, Love Cher from The Ebersole Hughes Company. Dear Mom, Love Cher is directed by P. David Ebersole and produced by Todd Hughes in association with Lifetime Network. Sunday May 12 at 8.30pm on Bio.